It helps at nine years old, that if you want to design and publish your own board game, your father is the creative director for a British RPG and games publisher. This is not to say that the resulting game is published via said publisher, but rather that your father has some expertise and knowledge when it comes to designing a game and getting it published. And get the game published father and son did after a successful Kickstarter campaign. The game is The Forest Dragon: A Card Adventure Game. The designer is Rory and he is nine years old. The creative director is Jon Hodgson. The publisher is Cubicle Seven Entertainment and it did not have a hand in publishing The Forest Dragon. Designed for two or more players aged six and up, The Forest Dragon is a simple, fantasy-themed push-your-luck style card game. It consists of sixty, full colour cards each illustrated by Rory and his younger brother, Ben. Seven of these cards give the rules. The others consist of resource cards—such as Sticks and Berries, treasure cards like Golden Coins and Crystal Compass, monster cards such Sinister Cloaked Gentleman and the Cursed Crocodile Knight, and adventuring item cards like Bow and a Friend. Both the resource and the treasure cards are worth Victory Points at game’s end, for example, Berries are worth a single Victory Point and a bottle of Ghost Milk is worth four. (The game does not explain what Ghost Milk is.) Monster cards typically end a player’s go, like the Wolf Pig, whilst others have an extra effect, for example, the Venom Spitting Snake also forces a player to discard three items. Adventuring item cards aid a player, for example, the Sword can be used to defeat one monster per turn, whilst Rations can be discarded instead of a treasure card. At the start of a game, the cards are shuffled and laid out face down in rows of five. Only twenty such cards are needed for a two-player game, with a further row needed for each additional player. This forms the forest that is home to the Forest Dragon. Then on his turn each player explores the forest by drawing one card at time. If the card drawn is a treasure, resource, or adventuring item, the player puts them in his backpack. This is invariably sticks or berries—there are lots of sticks and berries in the forest. If the card drawn is a monster, the player has to what it says on the card. Typically, this is to end his turn, but he might also have to discard cards from his backpack. Should a player have an appropriate adventuring item in his backpack, he can use it to overcome the monster. For example, the Sword can be used to defeat a monster and carry on adventuring whereas other adventuring item cards have other effects, such as the Map which enables a player to examine two cards on the table and take one of them. A player can continue exploring the forest and drawing cards for as long as he wants or until he decides to stop or draws a card that instructs him to stop. Then the next player begins exploring the forest and drawing cards, and so on and son. Play continues until all of the forest has been explored and all of the cards examined. At this point, each player totals up the Victory Points of the cards in his backpack and the player with the most is the winner. 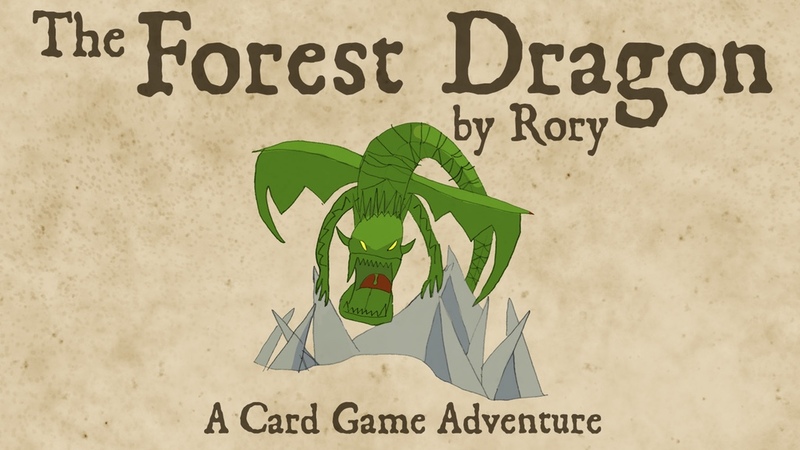 This is all that there is to The Forest Dragon: A Card Adventure Game. It is simple to learn and play and a game will last no more than ten minutes at most. As much as it is a push-your-luck game, it is also very much a luck based game and this can lead to one player running away with Victory Points upon Victory Points—play can be a bit one-sided if this happens. Fortunately, The Forest Dragon is a quick game and once game is over, it is simply a matter of collecting the cards, shuffling them, and laying them out again. Physically, The Forest Dragon: A Card Adventure Game is very nicely presented. The artwork is charming and the cardstock feels good in the hand. Even the tuckbox that the game comes in is easy to use. In terms of its rules, The Forest Dragon: A Card Adventure Game is not a sophisticated game design, but in terms of game play it is a surprisingly sophisticated design. When playing this game you can imagine yourself on an adventure to find monsters and treasure—or at least out collecting sticks and berries and discovering something more!—and so every time you play The Forest Dragon: A Card Adventure Game, there is a story to tell in the process of exploring the forest. For that, The Forest Dragon: A Card Adventure Game is a delightfully charming filler.